Japan, year of the emperor Meiji 5 (1872). It’s a time of transition and modernization, a time of change and learning from the west and the time of a success story that continues up to now. It is the story of Ramen, an indispensable part of japanese local diet becoming a celebrated food all over the world. But let’s tackle things one at a time. 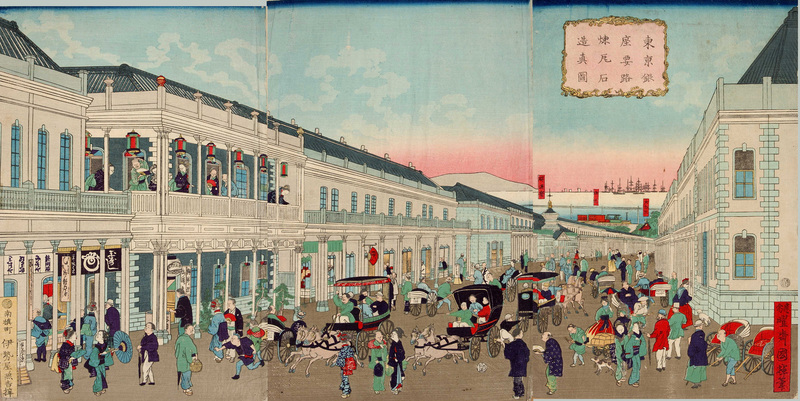 Japan at the end of Edo period (1603 – 1868). More than 200 years of self-imposed isolation from the outside world gave rise to a samurai centered class society accompanied by a time of peace, economic welfare and cultural flowering. In Edo era Japan, all aspects of life were soaked with cultural development and food culture didn’t make an exception. Early japanese haute cuisine restaurants came into being at the middle of the eighteenth century and first restaurant guidebooks emerged at the end of 18th century. The emphasis on aesthtetic food decoration dates from this time. Dishes had to be beautifully designed, representing the season of the year. Every month of the year had its’ appropriate food. A japanese cuisine, almost unaffected by foreign cultures highly focusing on aestetic aspects came into being. But things changed. Locked away from the outside world, Japan missed the technical improvements of the western countries. Industrialization as well as the enormous progress in weapon technology passed by unnoticed to the japanese rulers. Therefore, in 1853, it was an easy task for foreign powers to enforce the opening of Japan using gunboat diplomacy. After years of heavy turmoils reformers gained control over the country starting a transformation that no one had envisaged before. Bunmeikaika (Civilization and Enlightenment) was the slogan of the time. Basically, it meant learning from the west to transform Japan into a modern society. Western technology, western lifestyle and fashion and western languages became popular. Foreign influences could be seen all over the country and Ramen was among these innovations. The first Ramen restaurant opend its’ doors in the midst of Meiji restauration in 1872 in Yokohama. Ramen, signifying chinese noodles combined with a japanese soup and japanese toppings were first sold in the chinese quarter of Yokohama. After a while, starting in larger cities, Ramen restaurants spread all over the country. The original taste enhanced over time, regional ingredients and flavours were added and even the noodles changed. With their strong background in perfection and aesthetic food preparation, japanese chefs transformed Ramen into a unique japanese dish, completely different from its’ origin. It is the value of kodawari (doing everything the best you can do) that turned an ordinary noodle soup into an extraordinary dish making it to one of the most popular foods in today’s Japan. Asking for the typical Ramen taste, the word umami is mentioned frequently. This taste, usually applied to the soup, is created by different ingridients. Ramen noodles are, compared to ordinary noodles, much more demanding in production. Experience and professional skills are required. Selected toppings are added to enhance the taste. Eventually, it is the decoration of the soup that plays an important part. Watching the elaborated decoration of a Ramen, a touch of edo style aesthetic can be felt still today.